Modern business is in a constant state of flux, and this has never been more clear than with the rise of the Internet. What was once considered a luxury has rapidly become essential to success in any market, and that means there can’t be any obstacle to your company getting online. As important as the Web is, many companies continue to struggle to access it, in part because Internet providers do not always offer them convenient, affordable connections. Providers often insist on bundling business Internet access with cable, landline, and other communication solutions, forcing companies to pay more if they didn’t plan to buy those other services anyway. Providers also tend to put caps on the total amount of data that clients can use per month, giving companies less flexibility in how often and in what ways they use the Web. Phoenix Internet offers affordable, flexible access to the Internet without these strings attached. Operating throughout the Phoenix metropolitan area and much of Arizona, we provide a range of service options to meet your speed and budgetary needs. We don’t place caps on your data usage, and won’t bundle your Internet with any other services that you do not want. With our help, your business can maintain flexible, affordable, and fast Internet access for the long haul. Phoenix Internet recognizes the sheer variety of reasons that businesses need the Web, and strives to address all of them. While most people picture commercial Internet as a service for office workers in fixed locations, it is necessary in far more settings than just this. Construction workers, for example, often need to go online from their phones while on site, whether to communicate with each other, call for more supplies, or review instructions on how to do their jobs. Likewise, hotels and other hospitality businesses may need to project the Internet into outdoor spaces, both to enhance their customers’ experiences and to keep in contact with their employees. Phoenix Internet has experience meeting all of these Web needs and more. 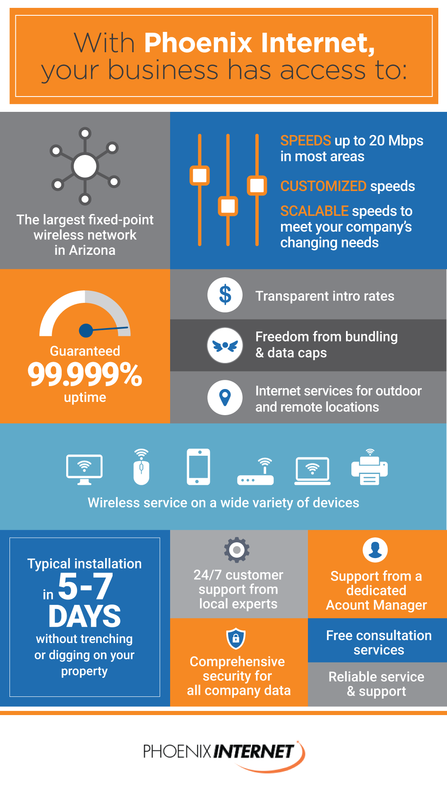 We understand the unique technical and environmental requirements of providing online access in the Phoenix area and are committed to keeping our customers connected in all circumstances. By keeping our service fast, reliable, and affordable, we allow businesses in all industries to communicate efficiently for the long haul. To learn more about our services or obtain a free consultation for your business, visit our website today.